Football. America’s most loved sport. But all the tailgating, touchdowns, and tears hinge on one of the most tedious and thought-out processes of the game: recruiting. What many fans aren’t aware of is how a player chooses a school. Not only do coaches hunt for the best of the best to play for their team, but they must convince recruits to choose their program. 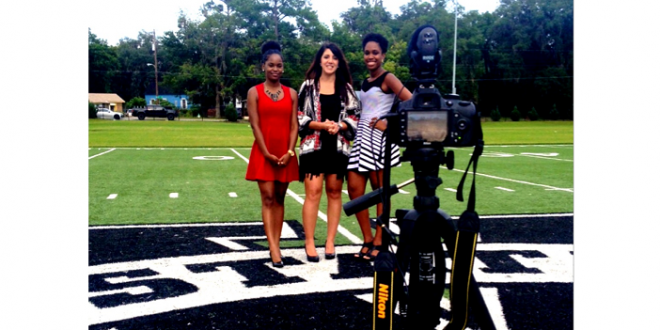 One of the marketing strategies used at VSU has been a key in its recruiting efforts. Blazer Pride is a yearlong women-only recruiting club that devotes its Saturdays to the potential VSU players. The women meet once a week to be prepped on visiting recruits so that they may be properly greeted and feel welcome at the university. Blazer Pride President Alyssa Riggs goal is to find 30-40 women who are able to offer tours to potential players, and introduce them to the university. She also has to match recruiters with players, get player information, and create player surveys for coaches, as well as host the players’ families. In the fall, making the players as comfortable as possible means a catered lunch, showing highlight videos of past seasons, and front row seats during Blazer football games. Football recruiting is a whole new world in the spring, where the coaches can focus more on future players. This also means the job of Blazer Pride shifts from 30-40 escorting nearly 200 players and families, to a more personal five or six women focusing on one family at a time. Riggs has been with the club for over two years and contributed to the recruiting of 35 new players last year alone. She believes that there has been an influx of new commits since the Blazer Pride club picked back up in 2012, from being dormant for quite some time since its start in the early 1980s. More players signing just means that lipstick and some parent/recruiter bonding has been an effective part of VSU’s overall recruiting strategy. It’s not the interaction with the families but the one-on-one interaction with the players that has given other similar female only recruiting organizations a bad reputation and viewed as crossing the line. Riggs makes sure measures are taken to keep the program on the up and up. Blazer Pride itself gives back to its members. The former Blazer Pride President, Payne, is now a full-time VSU admissions counselor and recruiter who travel across the Southeast, convincing high school students to choose VSU. Riggs on the other hand plans to use her newly acquired football knowledge to pursue a career into the world of television sports broadcasting.